Active Ingredient Zinc PCA and a Natural Antibacterial. No perfume, no colour.Dermatologically tested & approved. Experts in sensitive skin. Gentle cleansing prepares the way for perfect moisturising and is essential for healthy, radiant skin. 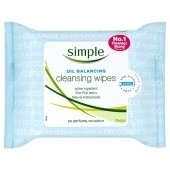 Control shine and thoroughly cleanse with our Oil Balancing Cleansing Wipes. They revive, tone and remove make-up, leaving your skin clean and fresh. Zinc PCA gently absorbs excess oil. Natural Antibacterial helps reduce blemishes. 100% Alcohol and Oil Free non drying, leaves skin soft with no greasy residue.